In this photo the children are having their dinner outside as it was such a lovely day and it was great for them to get some fresh air after all the recent bad weather. Everyone enjoyed eating their dinner outside so much that we decided to stay outside for yogurt too. 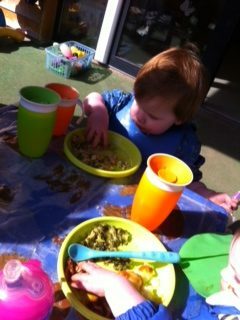 The experience of eating a meal outside was a very happy that the children shared together. In the future when it’s sunny we will have snacks outside too. Kate’s Mum though it was a lovely idea to eat outside. During circle time some of the children were talking about the weather for the calendar. Conor mentioned that there wasn’t any snow. We talked about what they were playing- the snow, making snowman and snow angels. Some the children made their own snow using conditioner, baking soda and water. Some of the children enjoyed squeezing the conditioner from the bottle. Tiarnan made a snowball using his hands. Emma covered her hands with the snow and held them out for Peter to see. Conor’s Mum told us he really enjoyed the ‘real’ snow when it was there. Kieran was a painting a picture for his special book. When he mixed yellow and blue together we saw that it looked like the colours of the sea. Next we got a brush, rollers and sponges to apply the paint using different techniques, some of the children asked to put blue glitter on the painting. We spoke about different animals that live in the sea and the beach. Darcie told us when she goes to the beach she brings a bucket. We sang the crocodile song as requested by Sam after we finished painting. His Mum said he loves the beacvh and water, while Charlies’ Mum said his favourite colour was blue.